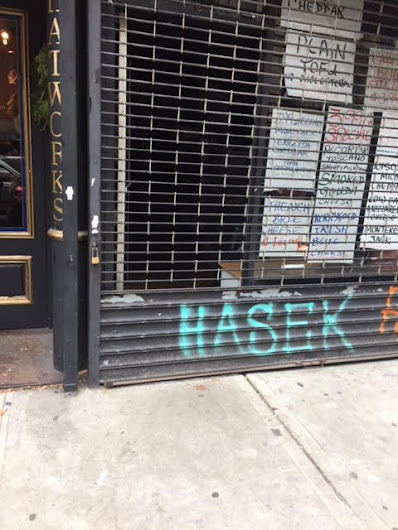 EVG reader Steph shared this photo from around 1:15 this afternoon... you can't quite tell from the photo, but the front door is open at the East Village Cheese shop, 80 Seventh St. between First Avenue and Second Avenue. There's an unconfirmed report from a tipster on the block that the landlord (or landlord rep) is inside the storefront assessing the situation. As reported yesterday, the shop has been closed for two weeks — and the electricity has been shut off during that time. No one has seen any member of the Cheese staff these past two weeks. Co-owner Lobsang Tsultrim was spotted at the storefront later in the afternoon... there was also a Remove All My Junk truck parked in front of the store. Not sure what the next steps are. 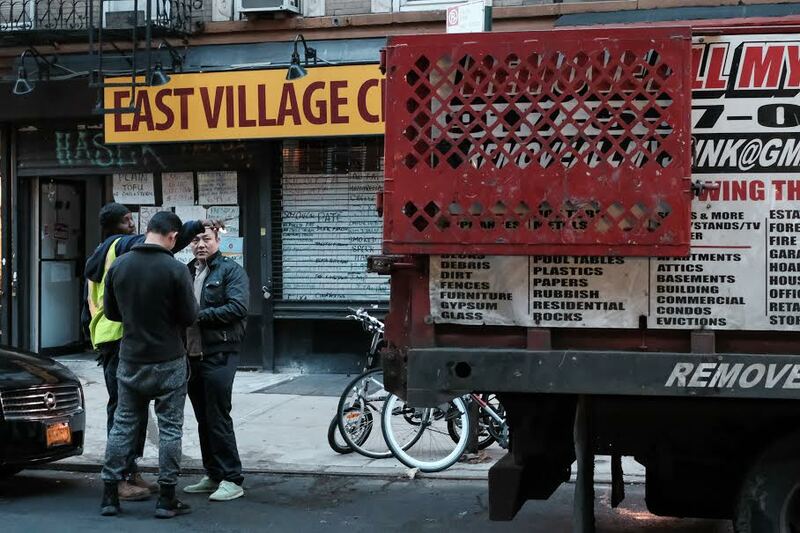 For now, Yelp is listing the shop as Permanently Closed. Whether a cheese is pasteurized or not would have little bearing on it's ability to be healthful for consumption after sitting at room temperature or higher for any length of time. No cheese would be pleasant to consume and in fact potentially dangerous when held outside of ideal conditions for this length of time, pasteurized or not. Or maybe it's a very LARGE and SUPER Strong and FAMISHED Rat? Liberals LOVE bad cheese. FACT. Actually that's what Hillary's emails were about. The funny thing is -- "former Tibetan Monks" (as Fox News reports), or not -- I believe at the time of the 2016 Presidential election the owners supported Trump. The store certainly appears to be doing an intentional bunk. First, big sales just before Thanksgiving followed by (1) not receiving a cheese delivery (why? did they pay for the previous one? ), (2) phone disconnected, (3) electricity off... all leaving their neighbors and former customers with lingering rat-charming cheese fart. Don't ever read the comments on FOX or the NY Post pages. You will lose all hope in humanity. Bill had toe cheese, according to “that woman”. There aren't any alleys near there, and scarcely any in the city. The idea of Fox comment writer not knowing what their talking about is ... not particularly shocking. Fox News is exclusively for the hard right, the not so bright and trolls who blame everyone but themselves for their misfortunes. I never click on a Fox link unless I want to lose all hope for the survival of the human race. Rather amusing to see people reacting as if a uranium processing facility had been left abandoned. It's just old food, hons, chill the eff out. It's sad how politicised our country has become that we think cheese is an issue right up there with the new tax-attack law. They couldn't give it to City Harvest when it was good? Past few years the quality dived. I avoided. Nothing like buying feta or marinated mushrooms and having them taste...off. I do miss as it was in its heyday on 3rd Ave. Anonymous 23 Dec 5:29, I agree that I wish that the owners had been able to donate to City Harvest. But it looks as if they were buoyed by the thought that things were somehow going to work out until they . . . didn't. Being forced out of Third Avenue seems to have rolled the snowball downhill. I have no personal knowledge of the internal workings of the business, of course, but I never caught a whiff of unkindness or scumbaggery about it. I'll miss this local business. They could've donated the cheese to City Harvest regardless. If the place isn't open and the food is still good, you don't let it go to waste, you donate it. It's a waste of food which is a scumbag thing to do because all it takes is one call to City Harvest to tell them you have food to donate. What is sad about this story is that for all of the talk of East Village mom and pop shops and how important they are to the character of the neighborhood, no one who has posted here and in the earlier thread (with perhaps the exception of one person) knew the names of the Tibetans who owned the store nor did anyone have any personal contact with them. No one seems to have been that friendly with any of the owners that they could supply accurate information (in the place of lots of theorizing and demonizing). So much for the mom and pop concept as an ideal. Anon. 10:56 - the difference is, mom and pop stores used to be staffed by - mom and pop, always there, never changing, so of course you knew them by name. The times I went to EV Cheese, the owners were never there, and the folks behind the counter were different every time. @ 10:56 am I don’t think it’s reasonable to say that based on the comments here. It’s not as if absolutely everyone in the neighborhood is represented by the comments here. This is a really small, self-selected sample of people familiar with the place. Will miss this shop tremendously and the lovely Tibetan people who ran it. So sad. Any updates on what's going on? the store still appears to be shuttered, without electricity and full of rotting cheese!